Car seat safety is one of the areas that I’m passionate about. It’s one topic that I will get up on my soapbox and talk about. It’s the one area where I feel like it’s important to talk to my friends about after they post a picture of their baby buckled incorrectly. Yes, I know nobody likes unsolicited advice and that’s why I won’t bother instructing my friends and family about how they shouldn’t feed their baby grains or shouldn’t use fragrances. Those things are trivial and more of a personal judgement call. 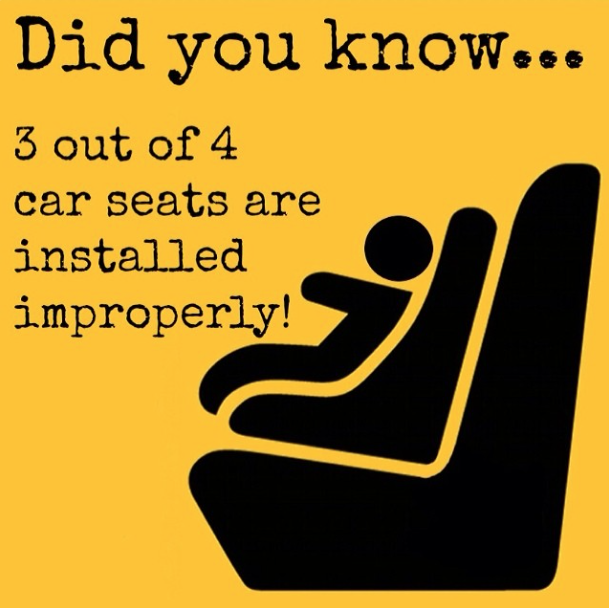 Car seat safety however, that can be live or death and if you do things wrong it can be illegal. Those two things are when I decide it’s worth being thought of as annoying or judgmental; serious injury and breaking the law. Last year, I took the whole month of September to talk about car seat safety. It’s a great series and I highly recommend you check it out. Now I’d love to do another month long series but I figured some of you aren’t ready for that again. So instead, I’m going to do just one summary type post. Consider it a refresher course or a cliff note to pass on to friends and family. I have 5 kids and I will admit, I didn’t always buckle my kids properly. I didn’t always follow the rules. It’s quite likely that I wasn’t even aware of all the rules. I do now and that’s why I like to pass along all the information because sadly, car seat safety is just not widely known or talked about. And it should be! A chest clip is called a chest clip for a reason. It needs to go all the way up at chest level. Not down by the stomach, not up by the throat. 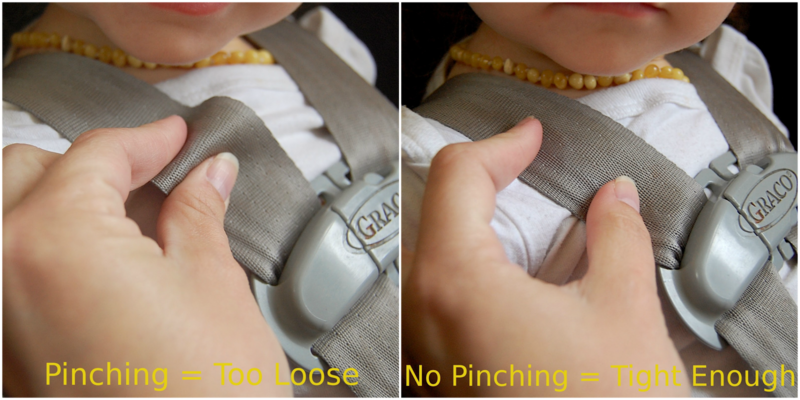 If a chest clip is too low, then a child could go flying right out of the straps. A good way to remember how high it should go is to raise the clip up to arm pit level. This always seems to be confusing for parents. The law is your child needs to be 20 lbs AND 1 year old before they can face forward. Many think that they just need one or the other but in reality you need both! Just because you have a 10 month old who is 25 lbs does not mean you can forward face their car seat. Weight is not everything. We have children rear face because of spinal development. Before the age of one, their spines are not strong enough for handling crashes in a forward facing seat. In fact, even the AAP now recommends rear facing until at least 2 years old because children are safer rear facing. Kids who continue riding rear facing from just ages 1-2 years are 5 times safer than their forward facing peers and forward facing kids under the age of 2 are 75% more likely to be injured in a car accident! It’s actually best to keep your child rear facing until they meet the weight maximum for rear facing. In my children’s car seats this means they can stay rear facing until 45 lbs! Those harness straps can be threaded through quite a few levels. Knowing which level to use is important. 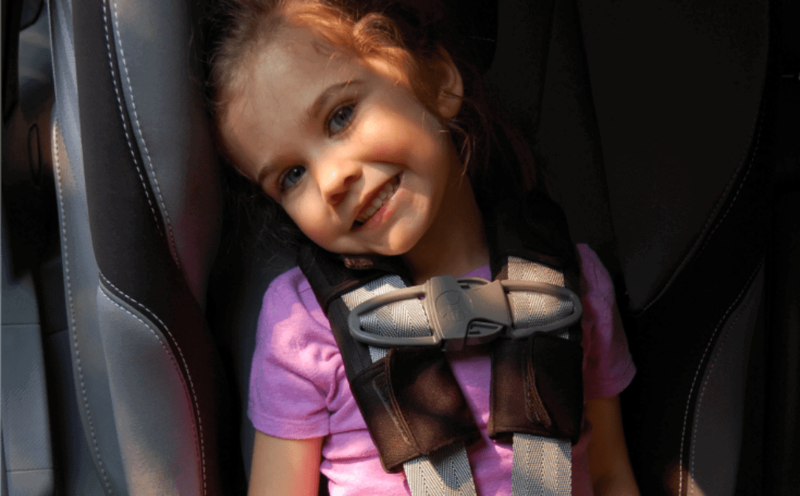 If your child is rear facing then the straps need to be at or below the shoulders. 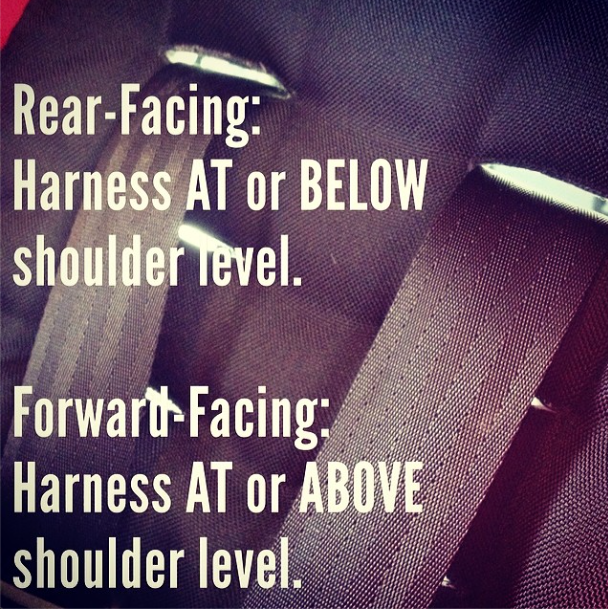 If your child is forward facing then it’s at or above the shoulders. 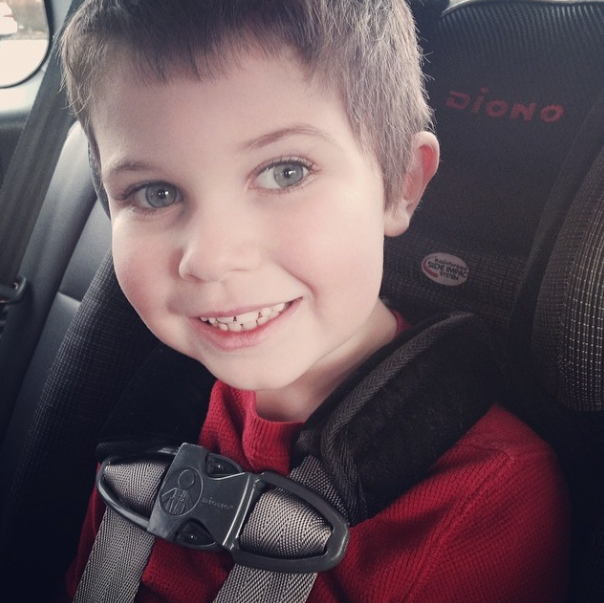 Yes there are a lot of rules to properly buckling a car seat! The straps on a car seat need to be snug. Yes, it’s much easier to get a child into a car seat with loose straps and that’s fine if you make sure to cinch them snug again. A good way to make sure the straps are tight enough is to do the pinch test. If you can pinch the strap then it is too loose. Car seats expire and when they do then those car seats are no longer safe. I know it seems odd but they do. The plastic can break down and even though it might not look like it; it can become unsafe. Car seat safety standards also change over time so a car seat that passed standards 8 years ago might not now. Most car seats expire between 5-10 years with 6 years seeming to be the norm. 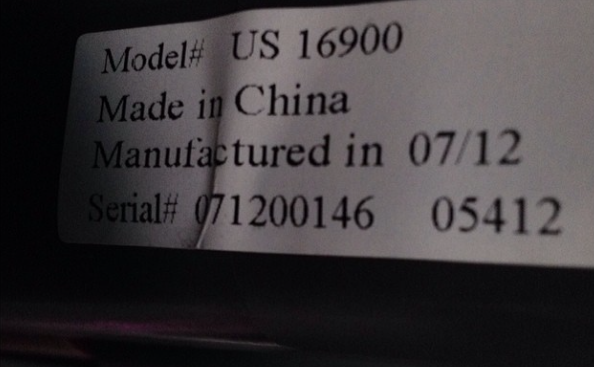 Make sure to check your car seat or manual for the expiration date. You also shouldn’t use a car seat that has been in an accident. It doesn’t matter if your child was in the seat or not. It doesn’t matter if the car seat appears to have no damage. The National Highway Traffic Safety Administration says that car seats which were in a sever or moderate accident need to be replaced. Now some car seat manufacturers disagree with the NHTSA’s rules and say that the car seat needs to be replaced no matter the size of the accident. 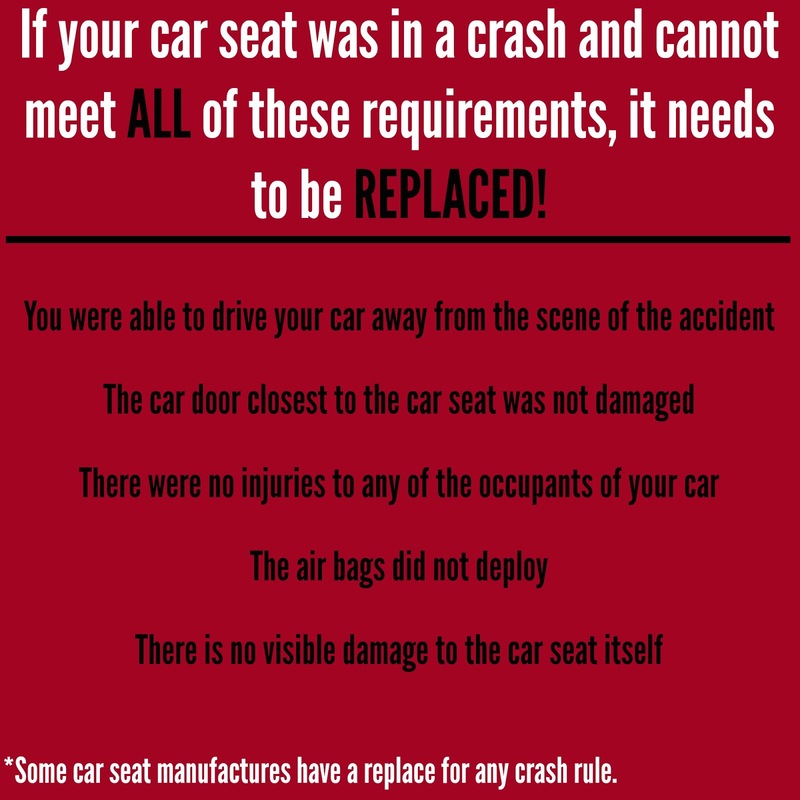 In order for your car seat’s warranty to still be valid you need to comply with the car seat manufacturer’s rules. The good news is that car insurances are supposed to cover the cost of replacing car seats. 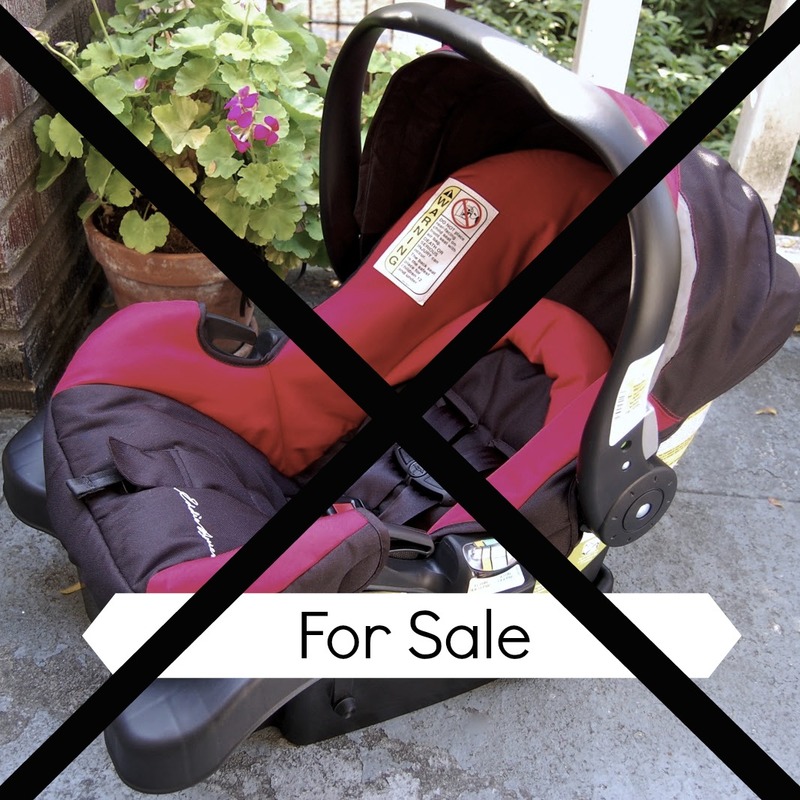 We all would like to save some money but buying a used car seat isn’t worth the risk. If you aren’t 100% certain of the car seat’s history then you have no idea if it’s been in an accident and thus unsafe. All those cute strap covers, winter bundle me covers, car seat covers that you can buy to give your car seat more style… they aren’t safe. If it doesn’t come with the car seat then it’s not been tested to see if it will be a hazard. So use strap covers that come with the car seat, ditch the bundle me covers (alternatively you could use the kind that go over the car seat; you just don’t want anything in-between the baby and the straps or car seat. 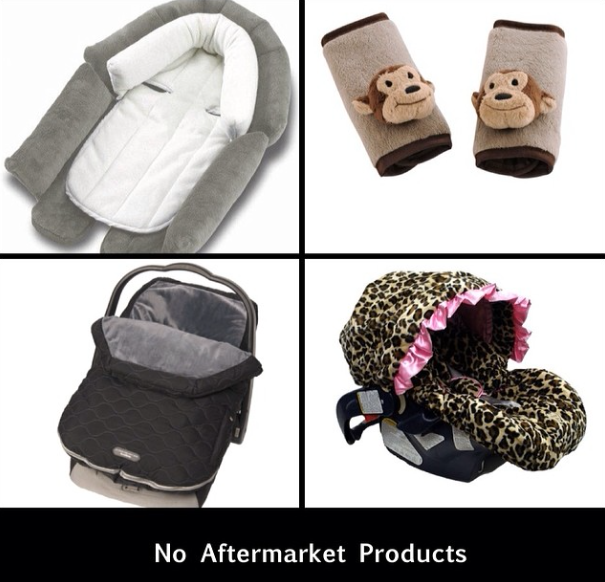 ), and only use car seat covers that are made by your car seat’s manufacturer. 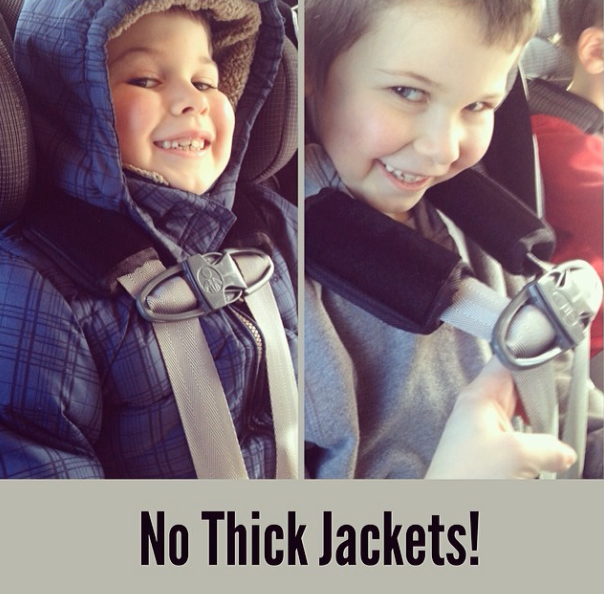 Yes, you want your child to stay warm but allowing them to wear that thick coat can be a safety hazard. It might not seem like it but the difference between how snug car seat straps are with a coat on and how snug they are without a coat is huge. 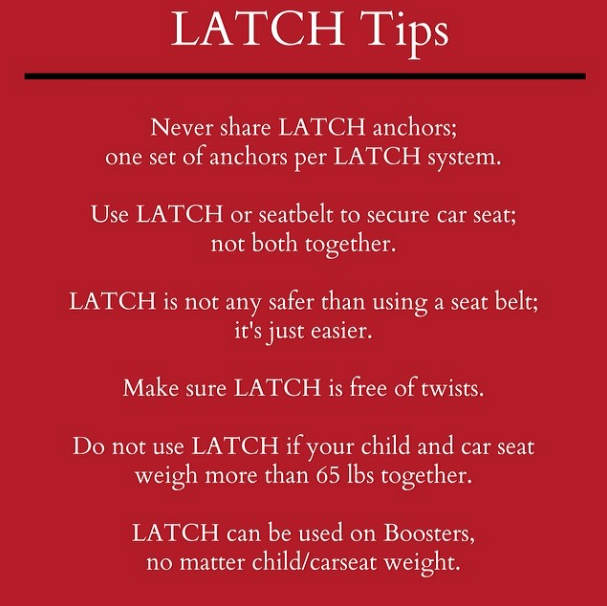 LATCH is a car seat installation system that makes installing easier. Not all vehicles have LATCH but if it does you should use it. However, there are some things to keep in mind: check to see if your vehicle allows LATCH sharing if you need to use the same LATCH anchor for more than one seat, cinch the LATCH belt tightly (see the next mistake), check the weight limit. A car seat needs to be so secure in the vehicle that it cannot move more than an inch. It can require a lot of effort to secure a car seat so well but it needs to be done. A good way to get a tight fit is to actually put your knees in the seat (basically sit in it) and then cinch the belt. I’ve written more in detail about installing a car seat properly if you would like more information. For some reason, we parents are always excited for our children to grow up and move on to the next big thing. Car seats should not be one of those areas. A child should only move up to the next level in car seats (from infant to convertible to booster to no seat) when they meet all the requirements. You should also be aware of when your child outgrows their car seat. It’s not just about weight and height. 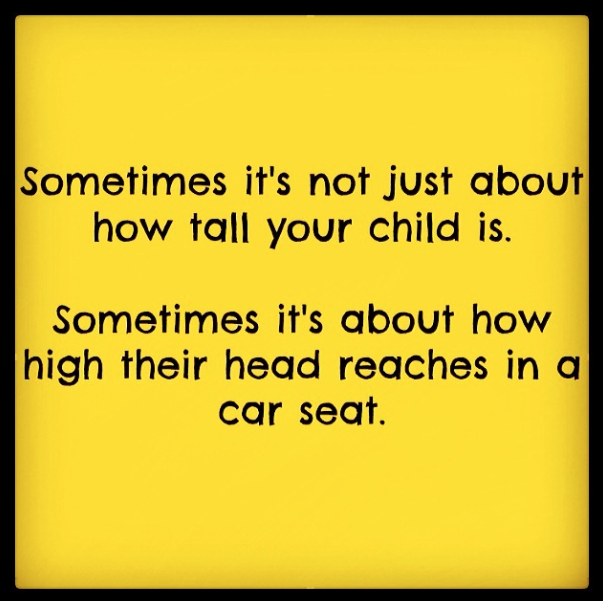 There’s also head height (children with long torsos may be too tall for the car seat even if they’re still under the overall height level.) Other height levels include ear level and shoulder levels. For more information on when your child has outgrown a set check out my post about when to change car seats. I’ll be the first to admit that I’ve done this many times in the past. It’s more convenient to put the car seat on top of the shopping cart. Sometimes they even seem to magically click into place. It seems secure so it should be fine…but it’s not. The real problem is that having a car seat perched on top of a shopping cart throws off the balance and the cart is then top heavy. A simple bump can cause the whole thing (cart, car seat, and baby) to tip over. Nobody wants that. 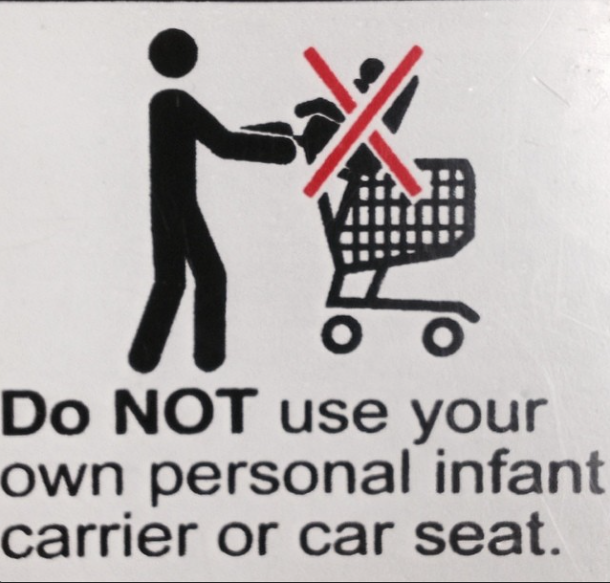 Simply take your baby out of the car seat or put the car seat into the basket of the cart. This is also an area where I’ve made mistakes. Infant car seats have these handy handles so that you can carry the baby in the car seat. However, when used in the car the handle is supposed to go in a certain position. Now some infant seats do not require a certain handle position but others do. It’s best to check your manual to see if you need to lock that handle into position or not. What about you? 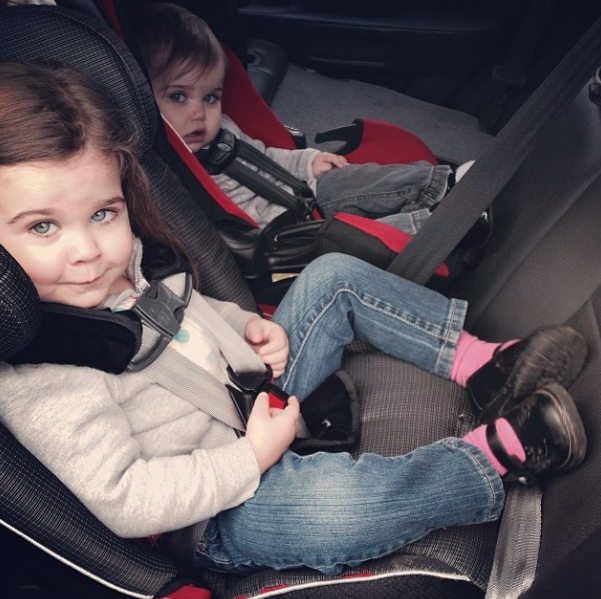 Are there any car seat mistakes that you’ve made in the past? 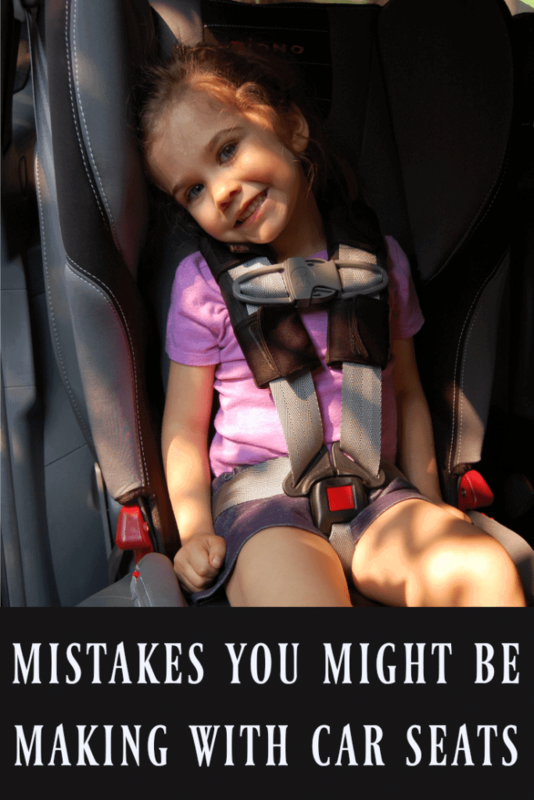 Are there any car seat mistakes that I forgot to mention?